He scoped the amount of work to assess how long it would take. He selected his favorite location where memory work happens the easiest for him. He scheduled his memorization sessions for evening time so that all the work could be solidified by the sleep process. His wife tested him at the end of each memorization session. He established consistency every day so that he got "into a groove that was almost robotic." He welcomed accountability. "What helped me get through this challenge was the fact that I tweeted my progress daily, which held me accountable to my followers and friends. The dedication this fostered surprised even me. Being accountable for your actions increases the chances of reaching your goals. It's easier, too, if there are other people, friends or family, who share the same goal..... You can let yourself down, but letting others down is much more disappointing." Tansel explains how the task finished up. " That final week, my white office table had become yellow, stained from the phone books, and I had a yucky metallic taste in my mouth from turning thousands of pages. By day 18, I had memorized all the material. So I went back to firm up my recall for the last 6 days." "On arriving in Sydney I found myself swamped with television, radio, and media interviews. I was tested live on national media and this time the hard work, strategy, consistency and sacrifices all paid off. It was a great success." 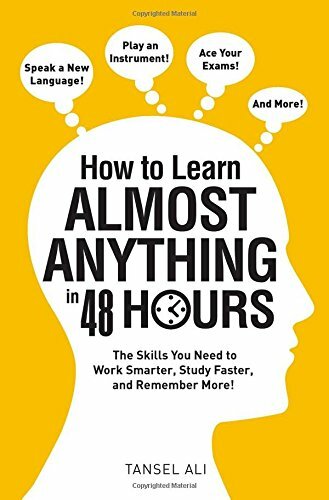 Tansel's story, recorded in his book How to Learn Almost Anything in 48 HoursThe Skills you Need to Work Smarter, Study Faster, and Remember More! * By Adams Media in Avon, Massachusetts, provides us with a few tips that can be translated into effective home schooling for an independent high school learner. "You need to create habits for your actions so that when working on your goals, the tasks come to you naturally. That's the point of creating a habit. You might have all the resources and plans at your fingertips, but unless you make it a habit you simply won't do the work." Students who are willing to be held accountable for their work have tapped into a great source of emotional sustenance. Sharing a record of which assignments or lessons were completed, as well as those that are still outstanding gives the student a sense of accomplishment as well as motivation to keep working. If you have a regular check-in schedule with your student, you'll have a better chance of noticing wrong turns or the beginning stages of discouragement. For students to have success as independent learners, they need frequent renewal of their sense of purpose, feeling of enthusiasm and ability to self-direct. That's why parents matter, even when students are at the high school level. You can be the cheerleader, the shoulder and the consistent accountability check-in. "Success is the sum of small efforts moving in the right direction, repeated day in and day out."